Tuesday • September 4 • 2012 Volume 79 • Number 36 INSIDE: Menards ? Sears ? For The Record ? Dining ? Employment ? School & Senior Meals ? Presorted Standard US Postage Paid Permit #8 ECRWSS Vermillion, SD bp Broadcaster Press Postal Patron Local Since 1934 201 W. Cherry ? Vermillion, SD 57069 ? Phone: 605-624-4429 ? Fax: 605-624-2696 ? www.broadcasteronline.com A hunter has to trust their gear at the moment of truth... A Great Hunt Begins With Us! Start This Season Off On The Right Foot With Tree Stands starting at 39.99 $ 10 Days Only! 10% OFF All Hunting Boots Archery Targets Ground Blinds Time To Buy Now ALL Hunting Clothing starting at starting at 49.99 $ 99.99 $ 10% OFF (Special Orders) Dove Hunting Ammo $ Winchester 12 & 20 ga. lead 5.99 $ Federal 12 & 20 ga. lead 5.99 $ Winchester 12 & 20 ga. steel 8.99 Dove Decoys $ Carrylite 4 pack 19.99 $ MoJo Wind Dove 12.99 $ MoJo Electronic Decoy 39.99 In The Field Ozone Generator Blankets your scent zone with scent destroying ozone! 3x12 Dog Dummy 11.99 $ Pheasant Training Scent 4.79 $ Stock Up Now! In FREE Ammo 20.00 Shotgun purchase With any $ 399.99 $ Dog Training Check Out The Used Bow Selection We Have a Seasonal Surplus! NEW or USED 2012 Pre-Season Bow Safety Inspection Completely FREE! 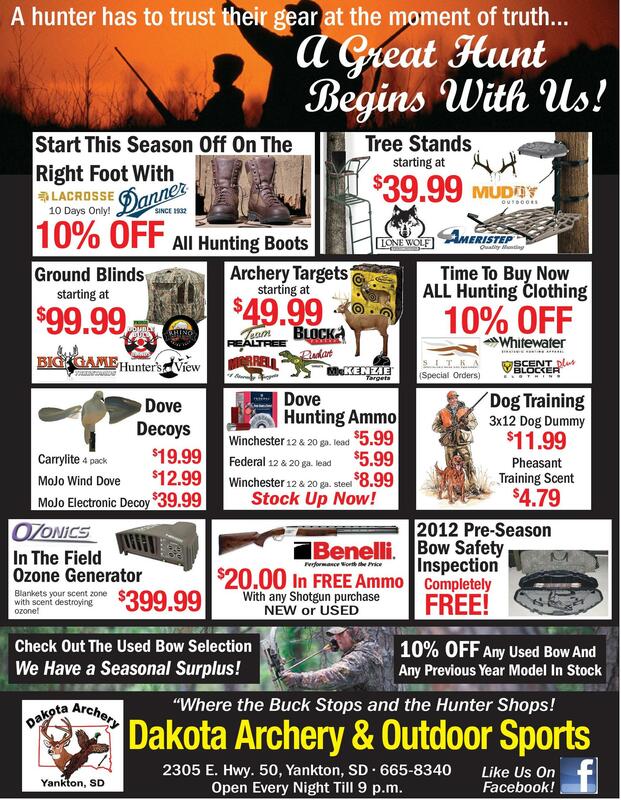 10% OFF Any Used Bow And Any Previous Year Model In Stock “Where the Buck Stops and the Hunter Shops! Dakota Archery & Outdoor Sports 2305 E. Hwy. 50, Yankton, SD • 665-8340 Open Every Night Till 9 p.m. Like Us On Facebook!